This range of cleaning chemicals and solvents are useful for a variety of applications. Most are safe to use on delicate electronics applications such as flux removal, electronics assembly, electronics repair, soldering and more. There are flammable and non-flammable options available along with Techspray’s more eco-friendly range. E-Line is a hydrocarbon based flux remover formulated to be powerful, yet very economical. Eliminates brushing and scrubbing, saving time and materials. The patented cleaning process of G3 Flux Remover is non-flammable, and an alternative to other products that contain HCFC-141b or HFE. TEC 1733 Zero Charge Cleaner is a neutral pH cleaner for general use in production areas. It removes insulating contaminants such as flux residues, oils, greases, nicotine, dirt, and grime. 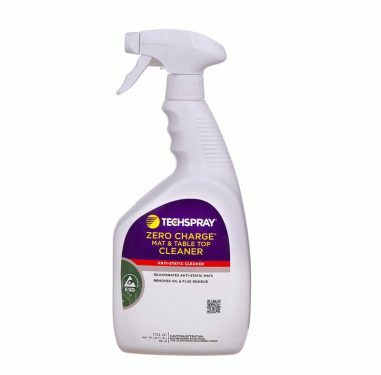 Techspray Renew cleaners are innovative solutions that combine the best current “green” technologies to make the most powerful green cleaners on the market. The range includes Eco-Shine™ Glass & Surface Cleaner, Eco-Stencil™ Cleaner for SMT cleaning, Eco-Oven™ Cleaner.